If you want to start a security business, first you must decide which kind of security you want to provide. Do you want to provide security guard protection, or install and monitor security systems for homes and businesses? Once you decide that, you will have to choose whether you want to start a company on your own or buy a franchise. Use this helpful guide to help make these important choices. Starting a business where you install security systems in people's homes or workplaces can be a good career choice with low overhead and flexible hours. The toughest part of this career is that it can be hard to acquire new accounts, especially if you are unknown since people want to trust their security with well-known, trustworthy businesses. A good way around this problem is to buy a security company from someone who is retiring. That way, you can just take over their accounts instead of having to find new ones. Alternatively, you can a franchise with an established name. When Do You Need Security and Protection Services? 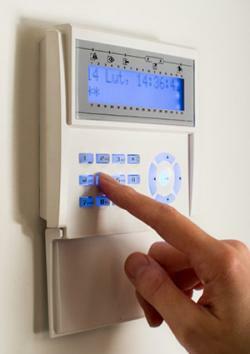 You need to have the technical knowledge to be able to install alarms, or hire someone who can. It can be hard to acquire new accounts, especially if you're an unknown company. You will need to be licensed as required by your state. According to Entrepreneur, startup costs are estimated from $10,000-$50,000. Shield Security Systems - You need to pay a franchise fee of $40,000, so your total investment will be from $74,275-125,550. You will also need to pay Shield five percent of your gross sales as well as a one percent national advertising fee. However, you must have a net worth of $250,000, as well as $75,000 in liquid assets, in addition to a strong operational background to qualify. Monitor Closely - Monitor Closely offers both residential and commercial security services, but its clients tend to be commercial, so if that's the area you want to target, consider one of these franchises. Monitor Closely offers clients digital video surveillance and has contracts with customers such as Dunkin' Donuts, 7-Eleven, Subway, and Courtyard Marriott hotels, so it shouldn't be hard to find clients. According to Home Business Mag, franchise costs are about $20,000-25,000, and start-up costs can go up to about $50,000. Sonitrol - Sonitrol provides security solutions for commercial locations, and its services include audio intrusion detection, electronic locks and badge readers, video monitoring, and fire and smoke detection. The company has provided security services since 1964, so you can be sure you're buying into a company with a good product and solid business plan. According to The Franchise Mall, Sonitrol franchise fees are estimated to be about $20,000-$50,000, with a total of at least $148,000 in initial start-up costs. Sonitrol also reportedly has a 2.5% royalty fee for franchisees. Security guard services may not seem like an obvious home security business, but consider marketing specifically to apartment complexes, neighborhood civic associations, and high-profile clients. If you choose to provide security guard services, however, there are higher overhead costs than there are with alarm businesses, since you will need more employees, vehicles, and an office. On the other hand, it might be easier to find clients, particularly if you make it a habit to reach out to new businesses who likely don't have security contracts yet. There is high demand for security guard services in the current climate of high crime rates and understaffed law enforcement services. The business offers reliable recurring income from long-term contracts. You will need to do extensive background checks on employees to make sure that you only hire the most trustworthy, responsible people. You will need to buy liability insurance and bonding insurance to protect your clients and their property in case of damage or theft. Security companies often bid on contracts, so prices have to be competitive and may need to be lower than you would like to win a client's contract. You will need to obtain required state and local licenses, as well as extensive background checks. You will also need to obtain gun permits if you intend to provide armed guards. All guards will need proper training. Signal 88 Security - You can purchase a Signal 88 Security franchise for $5,000-$7,000 in start-up costs, a $40,000 territory/franchise fee (which may increase depending on the size of your territory), a $35,000 vehicle cost, and an $30,000 of operating capital. The company offers financing options and discounts for veterans. Franchisees have to pay five percent of gross sales to the company. Arrow Security - While Arrow Security does not publicize its franchise fees, they offer a lot of training and support to their franchisees. The corporate offices provide you with administrative services, client leads, and training and recruitment help to ensure you have only the best staff. You have to contact Arrow directly to obtain more information on start-up costs and franchise fees. AmeriCop - AmeriCop is a security company that employs off-duty police officers, so you know your employees are trained and qualified. The company offers franchisees 40 hours of training at their corporate location, access to their national client accounts, and administrative support. Start-up costs range from $49,000 - $63,750 ($30,000 of which is your franchise fee for your territory), and you need a net worth minimum of $150,000 and a minimum of $30,000 in liquid assets per territory. Silbar Security - If you want to own a professional security company that strongly resembles official law enforcement, Silbar offers law enforcement grade vehicles and technology as well as professional law enforcement procedures. To start a Silbar franchise, you will need $47,000-$84,000 ($15,000-$20,000 of which is for your franchise fee) and five days to spend at their training facility. While home security businesses are a good choice for someone who wants to be self-employed and have flexibility with work, make sure you carefully weigh your options before deciding what kind of security business to start. There are many ways you can go in this field, and it's important to pick the one that is best suited for you to increase your chance of success. When you're ready, follow a step-by-step guide for getting your business off the ground.